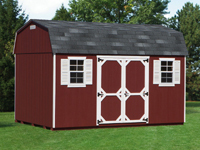 Bayhorse offers twelve models of Duratemp sheds. 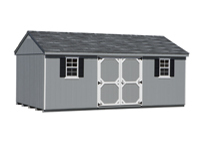 Economy Mini Barns (Dutch roof) and Economy Cottages (a-frame roof) are simple, functional, affordable and attractive. 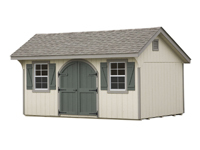 Our standard Mini Barns and standard Cottages include more standard features, but cost only a little more than the economy models. 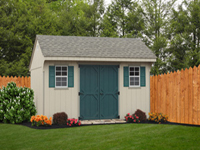 7' Cottages offer more headroom than standard Cottages with taller walls. 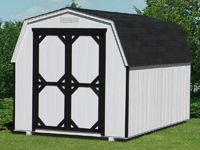 Dutch Barns have a classic barn appearance, Quakers have a traditional look with a taller front wall and deep front overhang and Capes have a rakish 7/12 a-frame roofline. 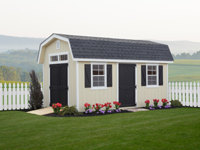 7' Capes offer more headroom than standard Capes with taller walls. 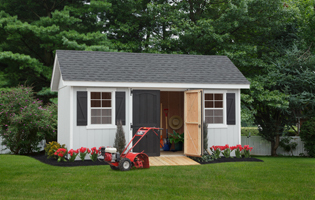 Our Classic Series sheds feature extra refinements that set them off from the standard models, including 1x4 wooden trim around windows, doors and corners, 1x6 wooden fascia and Z-pattern shutters. 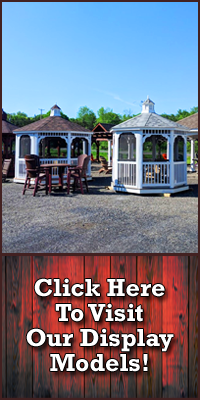 We offer Classic Cottages, Classic Quakers and Classic Dutch Barns. 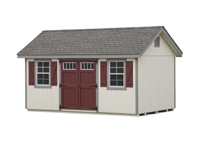 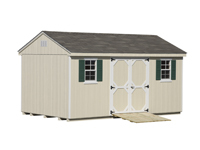 Each storage shed is hand-crafted in the United States by expert Amish woodworkers and available with your choice of paint and trim colors. 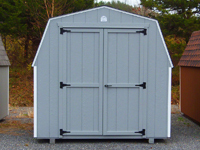 Additional optional doors, windows, gable vents, ramps and storage lofts are available to meet your specific requirements. 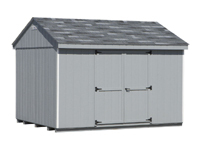 Our Duratemp sheds are also available in a wide range of sizes from as small as 6 ' by 8' to as large as 14' by 48' and just about every size in between. 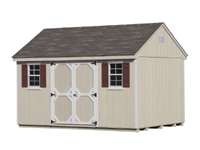 If you don't see the exact size you need, please contact us for a custom quote.